Ocean Gate Zen Center is located on the central coast of California in the small beach town of Capitola, adjacent to Santa Cruz. Our name reminds us that the Buddha Way is an endeavor as expansive and deep as the ocean. As those who aspire to embody the bodhisattva path we have come together to create community: a gate through which we can enter and sustain Zen practice. It is our intention to warmly welcome everyone who comes to Ocean Gate. Daijaku Kinst offering a dharma talk. We have the great fortune of having two teachers at Ocean Gate Zen Center. Daijaku Kinst and Shinshu Roberts trained at San Francisco Zen Center and received dharma transmission from Sojun Weitsman, the abbot of Berkeley Zen Center. Both Daijaku and Shinshu hold appointments as Kokusaifukyoshi (International Teachers) from the Soto Zen School in Japan. Daijaku is a professor and the director of the Buddhist Chaplaincy Program at the Institute of Buddhist Studies, a graduate school affiliated with the Graduate Theological Union in Berkeley, CA. Daijaku and Shinshu lead the sangha and teach as a team, providing a rare opportunity to work closely with two teachers and to see the practice manifested in their relationship to each other and with the sangha. The Dharma is authentic within each person, and plays out differently for each one of us; it is helpful to have two teachers each teaching from their own individual depth of experience, yet expressing a unified place of understanding. The conversation between our teachers, done with skill and humility, offers a deep and rich learning experience. 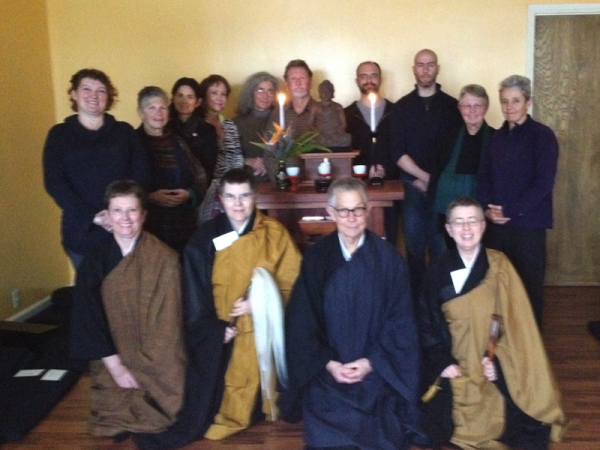 The sangha, with teachers Daijaku Kinst (front, far right) and Shinshu Roberts (front, second from left). 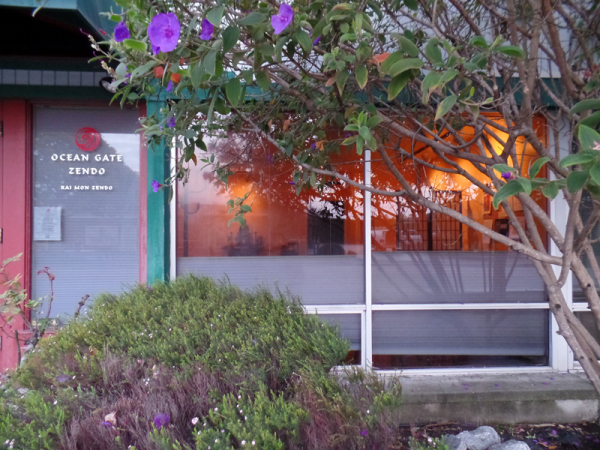 Ocean Gate provides a warm and welcoming community that deeply supports Zen practice. We think of our zendo, which is part of an office complex, to be a true urban place of practice. We sit in the midst of the daily life around us. Sometimes we hear the seagulls as they fly overhead; at other times we sit zazen during the morning commute on the busy street outside. We are never far from the reality that this very moment is the expression of Buddha nature. We are a small group, and one of the gifts that come from our size is intimacy and connection. 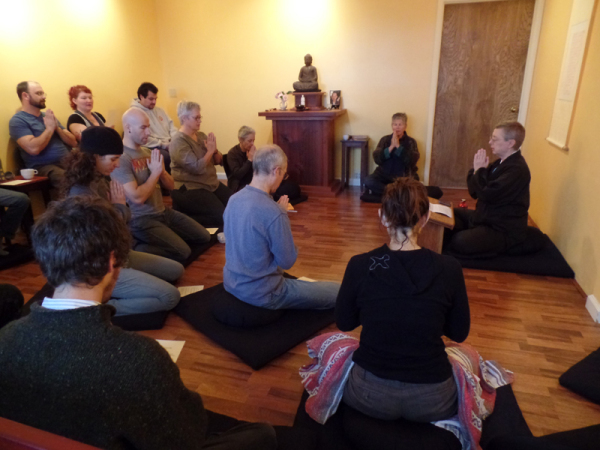 Zen practice is a group practice, and we offer many opportunities for people to participate in practice as a community. Since we are small, everyone has a voice; it is a place where every person can be engaged. Most of our sangha members are working, and some have children. In short we have busy and full lives. We explore how to maintain a deep and abiding Dharma presence in our activity. Daijaku and Shinshu emphasize that practice is grounded in daily life. We are encouraged to embody the Dharma at our workplace, at the grocery store and while driving our cars. Our bodhisattva practice continues like waves from the center of zazen out into the wider community. Besides formal practice, we have potlucks, picnics, and movie nights, and we work on various sangha activities together. Amazing teachings can happen when you least expect it, and we grow and learn simply by spending time together with our fellow practitioners. Regular Morning Sitting and Extended Practice. We offer a schedule of regular morning sitting and chanting, which provides a strong foundation for incorporating practice into our daily lives, as well as periodic extended sittings and retreats. Come As You Are Zen. Our Saturday morning program includes zazen, a dharma talk and tea. This is a gathering focused on learning and discussing the teachings of Soto Zen in daily life. We are always delighted to welcome newcomers. Healing and Compassion. Our Friday schedule includes a 40-minute period of zazen, followed by a special chanting service. This service is dedicated to the well-being of those who are suffering and specific individuals known to the sangha. We also chant for the safe passage and remembrance of those who have recently died. For a current schedule of activities and recorded talks please visit our website: www.oceangatezen.org. Visit SFZC�s website for a directory of Branching Streams sanghas, or for more information, e-mail us at branchingstreams@sfzc.org.